This issue of StateScan Quarterly highlights state legislative and regulatory activity in the first half of this year, including actions on principle-based reserving, Medicaid expansion, and insurance for ride-sharing operations. Forty-five states have now made changes to their Standard Valuation Laws (SVLs) for life insurance that would allow life insurers to start utilizing principle-based reserving (PBR) methodology beginning Jan. 1, 2017. In addition, bills to adopt PBR are currently under consideration in Massachusetts and Pennsylvania. The National Association of Insurance Commissioners (NAIC) required that 42 states representing 75 percent of direct written premium adopt new SVLs that were substantially similar to the NAIC model law in order for the Valuation Manual to become operative. On June 10, the NAIC Executive (EX) Committee and Plenary determined that the threshold of states had been met, a decision that will allow insurers to start implementing PBR on Jan. 1. For more information on states that have adopted PBR, see Principle-Based Reserving: A New Way to Insure for Life Essential Elements. On another key issue, nearly 20 state insurance departments have taken action on price optimization practices in the auto insurance market. In April, Virginia’s Bureau of Insurance issued a proposed regulation that states that using price-optimization techniques designed to maximize profits based on how much of a premium increase an individual policyholder is likely to endure before seeking coverage elsewhere is inconsistent with state insurance regulations. Legislative activities will be slowing down as more than half of state legislatures are scheduled to adjourn by June 30. 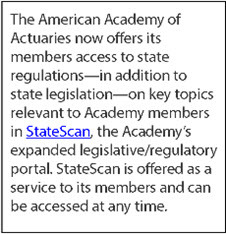 For a more comprehensive review of legislation and regulations in these and other issue areas, log in to access StateScan. Several state legislatures are considering proposals relating to ride-sharing and transportation network companies (TNC). New Jersey lawmakers filed a bill in May to regulate TNCs and mandate that TNCs and/or drivers carry minimum liability insurance coverage while drivers are logged onto the TNC’s network. In New York, AB 8195 would prescribe minimum insurance requirements for TNCs and drivers. Also, the New Mexico Public Regulation Commission issued a final regulation in May, governing insurance for vehicles in a TNC. In Louisiana, the governor signed into law HB 746 requiring all insurance producers and consultants in the state to complete at least three hours of instruction dedicated to flood insurance. Legislation was introduced in New York in May that would amend its workers’ compensation law relating to participation in a public group self-insurer. The legislation mandates that public group self-insurers file annual reports and a rating plan that is supported by an actuarial rate study. In 2016, several states have proposed and finalized regulations related to Affordable Care Act (ACA) provisions, including rate review and essential health benefits. In February, the Connecticut Department of Insurance proposed a new regulation that would, among other things, require a member of the American Academy of Actuaries to certify that all health insurance rate filings are in compliance with minimum state filing requirements. A number of states, including Utah and Washington, have proposed regulations that would modify 2017 plan year essential benefits packages. Nearly a dozen states have recently introduced legislation regarding ACA market reforms. In June, the Alaska legislature passed HB 374 that would set up a comprehensive health insurance fund to subsidize the insurance costs of the state’s ACA enrollees. A California bill would establish new cost-sharing limitations for large group plans that offer family policies that are also high-deductible health plans and provide for an individual deductible. Multiple states have recently introduced legislation involving Medicaid expansion. Kentucky legislators are considering HB 6, which would allow full expansion of the state’s Medicaid program. In May, North Carolina lawmakers introduced HB 1073, a bill that would mandate Medicaid coverage to people under age 65 who have incomes equal to or less than 133 percent of the federal poverty guidelines. In March, the governor of Utah signed a bill into law that implements a health coverage improvement program through Medicaid and establishes a funding mechanism as well. A Maryland Insurance Administration regulation proposed in June would cut the required minimum inflation protection benefit that must be purchased by an applicant who is younger than 61 years of age in order for the policy to meet the requirements of a long-term care partnership policy. New York lawmakers introduced in April SB 7168, the "Insurance Uniformity and Accreditation Act." The bill's preamble states that it relates to: "establishing the interstate insurance product regulation compact; to amend the insurance law, in relation to valuation of life insurance policies and contracts; insurance company corporate structure; to amend the insurance law, in relation to the replacement of individual life insurance policies or annuity contracts; and to reports required by insurers." The Nevada Commissioner of Insurance issued a proposed regulation in June to adopt the National Association of Insurance Commissioners (NAIC) Valuation Manual. In Massachusetts, legislators introduced HB 776 that provides protections to retirees whose pensions are transferred to a substitute pension benefit provider, specifically requiring that all de-risking transactions include supplemental protections in the form of a third-party guaranty or reinsurance contract. Alabama lawmakers introduced a bill in April that would prohibit various state employees hired on or after Jan.1, 2017, from participating in the Teachers’ Retirement System and the Public Education Employees’ Health Insurance Plan. Delaware lawmakers are considering two bills relating to captives. HB 411 would prevent double taxation of premiums ceded to captive insurance companies, and HB 412 would create a more refined regulatory regime for dormant captive insurance companies. Regulators in a handful of states have finalized regulations related to the NAIC credit for reinsurance model regulation. The Nebraska Department of Insurance finalized a regulation effective Feb.15 requiring that insurers maintain a reinsurance surplus of at least $20 million or have the state insurance director affirm that the reinsurer is solvent enough to meet its financial obligations. The North Dakota Insurance Department finalized a regulation effective Jan.1, 2016, that changes rules on credit for reinsurance, including setting security requirements on various ratings of insurers.